I found this piece of metal in the junkyard and cut a rectangular hole in the center with an oxy-acetylene torch, which made a perfect frame for Disconnected Detail. 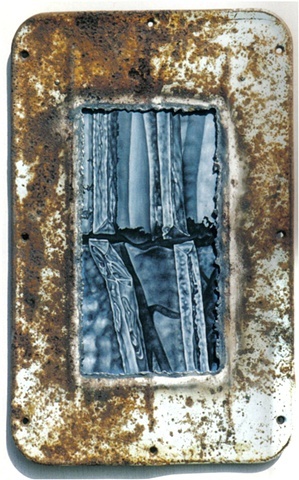 I was inspired by one of my photographs of steel doors and chrome decoration succumbing to rust. I inverted the image from horizontal to vertical to better fit the frame.